A new California legislative session started last week with the swearing-in of ten new Senators and 27 new Assemblymembers, the introduction of a hundred new bills between the two houses, and adjournment until January 5. These first-out-of-the-gate bills can be discussed in hearings as soon as the legislature reconvenes, since by then they will have been “in print” for 30 days. Bills introduced in January will have to wait a bit longer. Some of the new bills are placeholders that are likely to be further developed as the session moves forward, but some are identical to bills from last year’s session. A case in point is A.B. 8, from Assemblymember Mike Gatto (D-Los Angeles), which would create a statewide Yellow Alert system to inform law enforcement and the public about vehicles involved in hit-and-run crimes. It is exactly the same bill as last year’s A.B. 47. A.B. 47 sailed through both houses, then was vetoed by Governor Brown. Earlier in the session, the Governor had already signed a law similar to Gatto’s bill that allowed the existing Amber Alert system to expand from childhood abductions to include lost or missing seniors and disabled people. The governor said in his veto message that he didn’t want to overload the statewide alert system before the newly added pieces were tested. Gatto considered this an invitation to try again, and so he has. His staff says they are confident the bill will pass easily again–and that by the time it does the governor will have seen that the system is not overloaded. Other early bills in the 2015-16 session are listed after the jump. A.B. 28, from freshman Assemblymember Kansen Chu (D-San Jose), would require people biking at night to use a white flashing light instead of their red rear reflector. 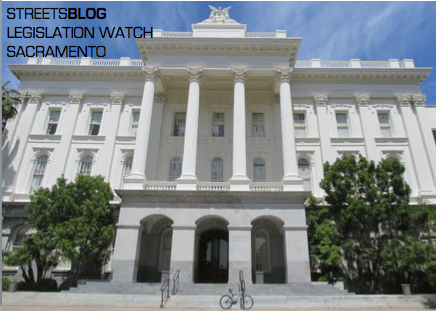 The new assemblymember and his small staff have not been available for comment as they said they are busy moving in to their new office, but Streetsblog will be following up to find out what problem this bill is trying to solve. A.B. 40, from Assemblymembers Phil Ting (D-San Francisco) and Marc Levine (D-San Rafael), would ban any attempt by local toll authorities to impose a toll on bicyclists on the Golden Gate Bridge, as they have considered doing. S.B. 32, from Senator Fran Pavley (D-Agoura Hills), would update her 2006 California climate change legislation, A.B. 32, setting greenhouse gas emission targets beyond the current 2020 goals. S.B. 40, from Senator Ted Gaines (R-Roseville), would limit rebates for purchasing zero-emission passenger vehicles to vehicles priced at $40,000 or less, thus eliminating state-financed rebates for car buyers who can afford high-end electric cars and don’t need the incentive. Also introduced in the first day of the session were three identical bills that propose to exempt fuel distributors from California climate change law: A.B. 32 from Assemblymember Jim Patterson (R-Fresno), S.B. 1 from Senator Ted Gaines (R-Roseville), and S.B. 5 from Senator Andy Vidak (R-Hanford). Almost all of the Republican members of both houses—and none of the Democrats—have signed on as co-authors to at least one of these three bills. The bill’s authors are presenting their legislation as a way to save poor, hard-working Californians from unnecessary taxes. Assemblymember Jim Patterson’s website features the misleading headline: “State Legislators Introduce Bill to Keep California Gas Prices Low by Eliminating the Gas Tax.” The post even quotes the Assemblymember saying that “when the gas tax kicks in, we will feel the pinch,” with a specious claim from the Clovis school district that this “gas tax” will mean a $100,000 loss. It’s all so very wrong. The bill would not eliminate the gas tax, and in fact has nothing to do with gas taxes at all. It would also have little to no effect on gas prices, which are a full 60 cents per gallon lower than they were a year ago. What it would do is create a singular exemption from California’s climate change legislation for one segment of the fuel industry. Fuel refiners have been subject to California’s cap-and-trade system for several years, and thus have been paying for the greenhouse gases they emit—which is meant to be an incentive to reduce those emissions. Fuel distributors had been granted extra time before they came under the cap, to allow everyone to figure out the best way to apply the regulations, and to give them time to plan for and adapt to the law. Now their extra time is over, and they are scheduled to come under the cap on January 1. Oil company-funded groups have been trying to rile up consumers by claiming a “hidden gas tax” will hit suddenly in January and force gas prices to rise. It looks like either some of the Republicans in the state legislature have naively fallen for this line, or they are just willing to use it in a cynical attempt to undermine climate change legislation. These three bills all include an urgency clause, but even so the earliest they could be heard is January 5, when the legislature reconvenes. It’s particularly strange that the proposed light bill wants a *white* flashing light on the rear of a bike – if you want to mandate a rear-facing light, it should definitely be red (and white lights should probably be prohibited, because they are the universal sign for the front of a vehicle in the United States). A further oddity of the bill – it allows the cyclist to use reflective clothing as a replacement for the flashing light. Why change the requirement from a reflector on the bike to either a light or a reflector on the clothing?! Fuel distributors used their “extra time” to figure out that the best way to apply the regulations is to not apply them. Good job. So, let me get this straight. Assemblymember Chu wants me to ditch the red (sometimes blinking) light that I have on the back of my bike and replace it with my 700W white light on strobe? Seems legit. Assemblymember Chu must own stock in a bicycle lighting company. His bill would render useless all the flashing red lights we all already own and require all of us to buy new white lights. Where are the studies showing the white light to be more effective than the red ones? This bill makes no sense and seems to be a solution in search of a problem. Does assemblymember Chu even ride a bike? Talk about an ::OVERLOADED:: system – in addition to the ongoing Amber alerts for lost children NOW it includes missing seniors and disabled people? Hey, why not pets, too? Or schizophrenics who aren’t taking their meds? Or escaped 5150 patients? The list is endless and makes the original alert a joke and a half. I don’t want my phone going off every 5 minutes so the Amber alert is going away on my phones. BUH BYE! Or a reflective band. Maybe his target is all the riders salmoning and on the sidewalk. In either case, that bill needs to die. No person shall operate on the highway a bicycle equipped with handlebars so raised that the operator must elevate his hands above the level of his shoulders in order to grasp the normal steering grip area. They need to use those emergency alert system signs to take your eyes off the road to remind you to wear a seatbelt… duh.